NEXTpittsburgh (July 30, 2018) -What makes America great? But as we learned last week in Pittsburgh, there’s still plenty to celebrate. From July 25-28, the fromage world’s superstars descended on the David L. Lawrence Convention Center for “Forged in Cheese,” the 35th annual conference of the American Cheese Society. 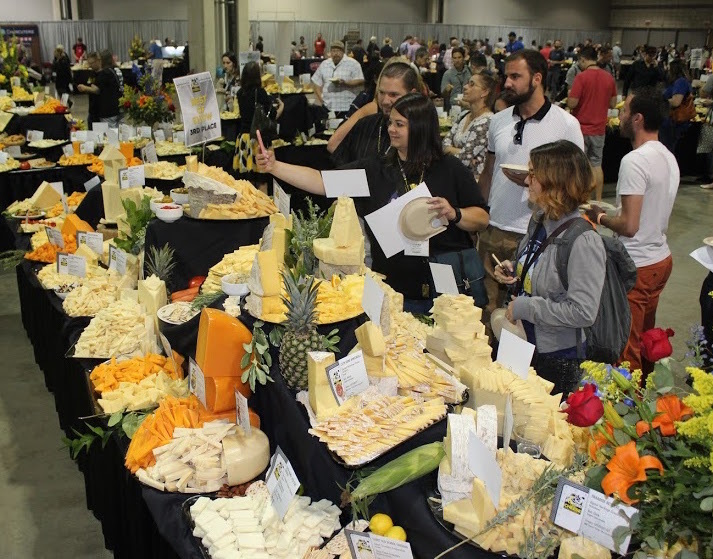 From tasting events to an award ceremony and even a 5K, the conference proved that when it comes to cheese, America’s still got it — from sea to shining sea. Throughout the conference, creameries and cheesemongers from 35 states (and a few Canadian provinces) let that freedom ring. On Thursday, more than 100 producers cubed, sliced and served their creations, allowing attendees to sample the fine “terroirs” that comprise the continent’s palate. From the West Coast: cow’s milk cheese soaked in red wine. From Texas: jalapeño-infused mozzarella. From our Amish neighbors in Pennsylvania Dutch country: sheep’s milk cheese that made me question my life choices and look for land out east. And that’s not to mention the strong showing from several Pennsylvania creameries, or the selections on hand from America’s dairy elite — seasoned pros from places like Wisconsin, Minnesota and Vermont. At Friday night’s award ceremony, the Vermont-based Cellars at Jasper Hill earned first and second place in the Society’s “Best of Show” category, outshining nearly 2,000 different cheeses submitted for competition. The creamery “exemplifies how American artisan cheesemakers seamlessly meld tradition and innovation,” said Weiser. And for all the kudos lobbed at America’s curds, America lobbed it right back at Pittsburgh — a city with a burgeoning cheese scene that welcomed the conference for the first time. Over the course of four days, Loevner and her peers took part in safety classes, late-night cheese soirées and breakout sessions with titles like “Old and New Frontiers in Bandaged Cheddar,” “An Optimistic Guide to Failure” and “How Sweet Are You? : The Science of Taste.” The conference culminated with Saturday night’s Festival of Cheese — a massive, open-to-the-public display of more than 2,000 award-winning cheeses. Though technically a gathering of competitors, the festival felt more like a reunion — an evening of hugs, wine and a gastrointestinally dangerous amount of cheese. Here were hundreds of farmers, cheesemakers and curdled milk enthusiasts from every corner of the continent, trading tips and shouting praise. Here were people who cared enough about cheese to trek to Pittsburgh and share it. Here were people whose swag bags were stuffed with salami and cutting boards — people who, if an emergency picnic were to suddenly break out, would have the rest of us covered. What makes America great? Plenty of things. And at “Forged in Cheese,” the list got a little bit longer.